In preparation for summer, I’ve been compiling a summer bucket-list so we’ll be ready with an activity when we are hankering to get out and DO something. 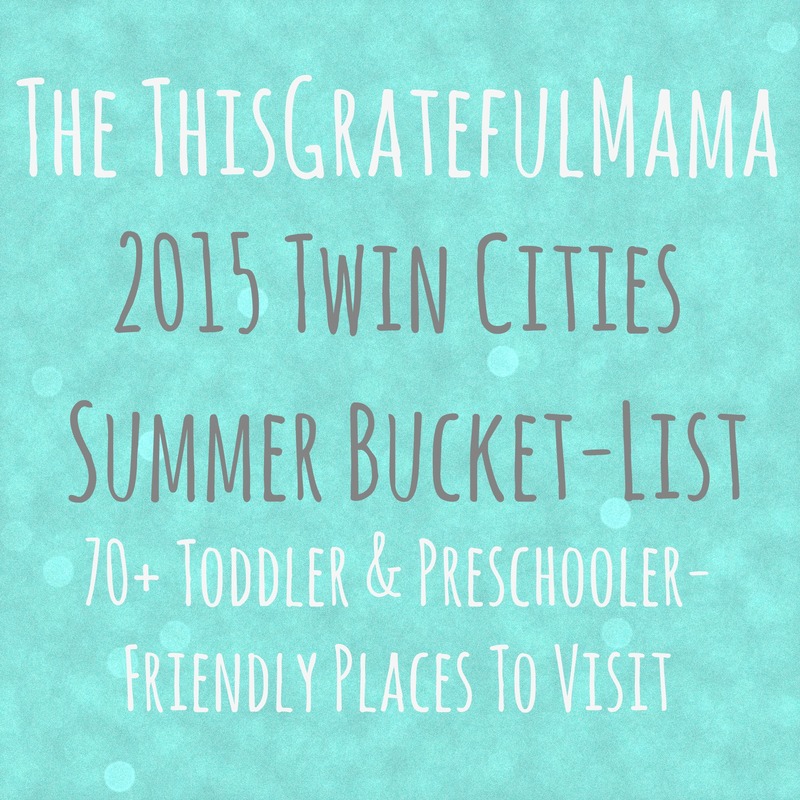 The list contains places and activities in and around the Twin Cities (MN), appropriate for families with little ones. I have been pleasantly surprised by the variety of activities we could do this summer. While I don’t think we’ll make it through this list in just one summer, we will have a lot of options. Of this I am certain – this much fun is meant to be shared! Below is the current bucket-list, or if you prefer, you can find the summer bucket list (and me) on Pinterest (oh yes, I recognize the blatant self-Pinterest-promotion – I’m not ashamed). I plan to keep adding new ideas to the Pinterest board throughout the summer and have just started fall and winter lists. A selection of the best family friendly summer events the Twin Cities has to offer. July 4, 2015 – Afton’s Parade and 4th of July Celebration. Small town feel, great fun! July 22 – 25, 2015 – Minneapolis Aquintennial. So much to choose from with a few main events listed below. Soak up the sun and fresh air with these outdoor parks and activities. My favorites are Miller Park and Round Lake Park in Eden Prairie (both free and have toddler and big kid play structures as well as splash pads). Finish out a fun morning with a treat from YoYo’s Donuts – extra special because this is a nut-free bakery. The brand new splash pad at Bielenberg Sports Center in Woodbury is scheduled to open June 6. Check out this list for several more. Carpenter St. Croix Valley Nature Center – miles and miles of trails in MN and WI along the St. Croix. Free to visit. Lake Elmo swimming pond – chlorinated, sand bottom pool. Need I say more? There is a charge per head/vehicle for this one. Starring Lake Playground, Eden Prairie – complete with two amazing 2-story slides. Our kids love this place! Gale Woods Farm – A working farm with some great, inexpensive programs for kids. You can visit together as a family and do/see chores on the farm Saturday mornings, toddler and me programs during the week with a preschool component and camps during the summer. Escape the heat or rain and fend off boredom with some indoor fun. Pinstripes Bowling and Bocce – TOTS play time during the week from 10-noon. $3/child/game, $4 shoes. Parents bowl free. Deal! Wooddale Fun Zone, Woodbury – roller skating anyone? You don’t have to travel far to enjoy a fantastic day-trip. Explore Hudson Wisconsin – just over the river. Walk the river, stop by Seasons Gallery and nearby studios to see artists create with ceramics and glass. If I were you, I’d eat at San Pedro Cafe, down the street. YUM. Thanks, you too! If you know of any other fun things, feel free to share them! I spent a summer working at Mayo in Rochester and I LOVED MN in the summer! Everyone so clearly enjoys getting outside and the activity options really were endless…plus the weather was just about perfect! I would have taken a job there had it not been for the winters. This FL girl could have never made it! 😉 Enjoy your summer…we’ll be sweating it out down here in FL! Next Post Friday Fun – Follow thisgratefulmama on Pinterest, Facebook and Twitter!